BERLIN - Kensington firefighter Patrick Buckley began the Sept. 11 memorial ceremony by detailing the events of that fateful day 17 years ago. Members of the audience nodded their heads in agreement. 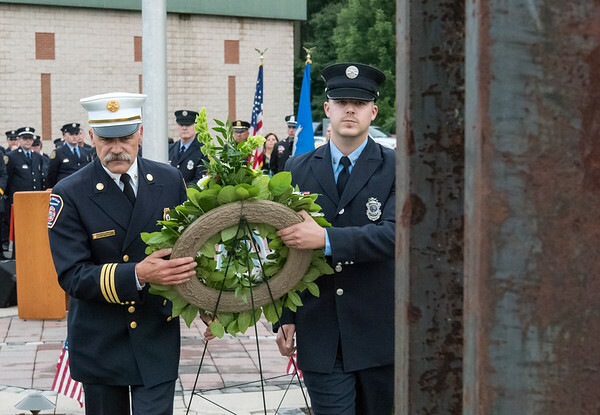 The Kensington Fire Department unveiled their 9/11 memorial on Tuesday evening. 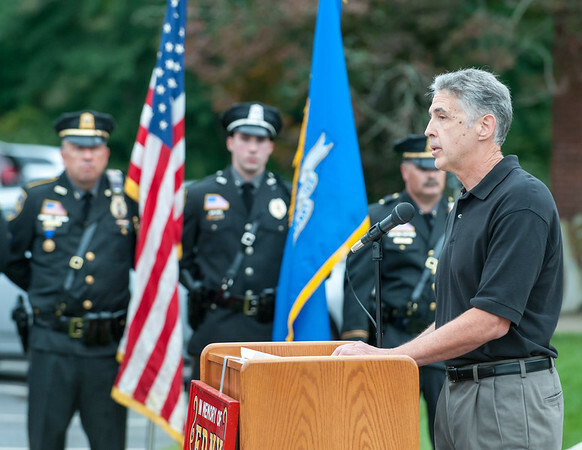 “My hope is that we never forget those that made the ultimate sacrifice and continue to do so, and we know that by people willing to stand up for our rights and others, that we do have the best country in the world,” said former Kensington Chief Mark Lewandowski during the ceremony. Among those in attendance were Mayor Mark Kaczynski, firefighters, House Speaker Joe Aresimowicz, state Sen. Terry Gerratana, town councilors, Town Manager Jack Healy, Police Chief John Klett, American Legion Post 68 Cmdr. Vinny Trigila, local Boy Scouts and members of the community. Current Kensington Fire Chief Jeff Pajor shared the story of one of the passengers that tried to rescure flight 93 that crashed in Pennsylvania. "'Are you ready? Ok, let's roll,'" Kensington Chief Jeff Pajor said the passenger asked those helping him. "This short quote is often what I think abou when I remember the day, what this memorial means to those who are here and those who are killed and to the daily lives of every first responder. When our backs against the wall, we are going to fight. We are going to help others, we are going to try to change a situation that is headed in a bad direction. The memorial, almost a decade in the making, consists of a main circular section near the front of the station at 880 Farmington Ave., with benches and two girders from the World Trade Center towers off to the side. They are erected in the upright position, resembling the Twin Towers that were destroyed in the terror attacks. A pathway from the circular section leads toward the girders, which are surrounded by pavers on the ground in the shape of a pentagon. A third beam, warped and damaged is mounted a few steps away from the beams within a circle. Each beam has light cast on it. The front part of the memorial, closer to the streetscape features planting beds and fresh sod all the way up to the sidewalk. Trees line the side portion of the memorial. The project cost $75,000 which was raised through donations and some department funds, said Lewandoswki. The design of the monument was done by AES Designs of Hamden. Labor and equipment was donated by several organizations including Manafort Brothers of Plainville, who helped transport the beams from a hangar at JFK airport to Berlin. Suzio York Hill, of Meriden, Mizzy Construction, of Plainville, CWPM, of Berlin, Glenn Terrace Landscaping, of New Haven, and the Public Works Department from the town also chipped in, as the Italian Independent Political Club in Berlin hosted a fundraiser. Also as part of the memorial, Donald Roski, a local Eagle Scout, refurbished an antique fire extinguisher with paint from Berlin Auto and made a memorial plaque. The area features lighting by Alexia Lighting of Newington. The idea behind constructing a memorial officially began in 2010 when Lewandoswki put in an application to receive the two girders. Construction of the actual monument began about four years ago after the department had to make a land swap to acquire the memorial area from neighboring CIL developers. It was expected to be finished in the spring, following several delays, but ran into drainage issues. Installing a sprinkler system for the grounds is the only thing that remains, Pajor said. That should begin by the end of the week, he added. Kensington firefighter Tyler Walsh, and his dad, New Britain Deputy Fire Chief Paul Walsh, carried the wreath laid next to the monument. Katie Rochette of Berlin High School choirs sang the national anthem. At the end, certificates of appreciation were given out to Manafort Brothers, Nadeau Brothers, Glenn Terrace Landscaping, CWPN, Manafort Brothers, Mizzy Construction, Suzio York Hill, Alexia Lighting, Town of Berlin Public Works, Town of Berlin Economic Development, Lewandwoski family, McMahon family, Fiori family and Messina family. The Berlin Fire Department and the Italian Independent Political Club also received recognition for their fundraising efforts. Posted in New Britain Herald, Berlin, General News on Tuesday, 11 September 2018 20:25. Updated: Tuesday, 11 September 2018 21:03.